THOUGHTSKOTO Thoughtskoto : Could Having A Sibling In Canada Help You With Your Plan To Immigrate? 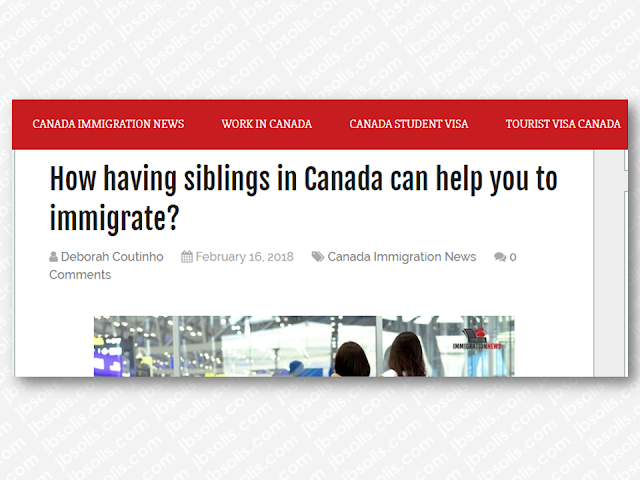 Could Having A Sibling In Canada Help You With Your Plan To Immigrate? On June 2017 a new rule for siblings in Canada came into force. Since then, it is benefiting many Express Entry applicants with a Canadian citizen or permanent resident siblings. “Especially if the candidate has not a high level of English or the ideal age for immigration, 15 extra points can make a good difference in the pool”, says the immigration consultant Marjorie Quintos. There is no specific Family Sponsorship program for brothers and sisters in Canada for a long time. But in some very rare and specific circumstance, sponsoring a sibling can be possible. If the brother or sister of the applicant is an orphan younger than 18 years. In addition, they can’t have a spouse, common-law partner, or conjugal partner. To be a sponsor the applicant must be a citizen or permanent resident of Canada , 8 years or older , have met the set income guidelines and agree in writing to give financial support to the relative for up to 10 years. This period begins on the date they become a permanent resident, if applicable. In June 2017 a new rule for siblings in Canada came into force. Since then, it is benefiting many Express Entry applicants with a Canadian citizen or permanent resident siblings. To be granted the 15 extra points in the CRS (Comprehensive Ranking System), the sibling of the candidate must be at least 18 years old. And the brother or sister must be living in Canada as Citizen or Permanent Resident. Also, the relationship between the candidate and his/her siblings can be through blood, adoption, marriage or common-law partnership. In other words, this rule is also extended to spouses or common-law partners if they are included in the Express Entry application. Also, siblings can give 20 points on the Manitoba Skilled Workers Overseas stream of the MPNP under the adaptability factor. The maximum of points for this category is 25 on Manitoba Skilled Workers Overseas stream. For this stream, all candidates must demonstrate a strong connection to the province in the adaptability factor. The strong connection can be through the support of family members or friends or other reasons. Previous education or work experience in Manitoba also qualify as a strong connection. An Invitation to Apply (ITA) received directly from the MPNP as part of a Strategic Recruitment Initiative count as well. Candidates only receive points for one type of connection, even if multiple apply to them. If the connection to Manitoba is through the support of family members or friends, the so-called “Manitoba Supporter” must be willing to endorse the immigration of the applicant. It means that the relative or friend must be already a resident of Manitoba and provide documents or demonstrations that will help in the application process of the candidate, like the list below. – Proof of familial relationship, in the case of close relatives. By close relatives, Manitoba Provincial Nominee Program accepts sister or brother; niece or nephew; aunt or uncle; first cousin; mother or father; and grandmother or grandfather. Daughter or son are not accepted. Applications are accepted from qualified temporary foreign workers and international student graduates who are currently working in Manitoba and have been offered a permanent job by their Manitoba employer. Although it uses the term “supporter”, it is important to reinforce that the MPNP is not a sponsorship program. Also, a paid immigration representative or a Canadian elected official or their staff don’t qualify as supporters. And as said before, it must demonstrate to be a relative or a friend of the applicant or the applicant’s spouse. In addition, having a supporter is not enough to qualify for the program. To be eligible, the candidate has to comprise the requirements of the MPNP steam that he or she is applying for. Since is oriented for economic immigrants, all MPNP candidates must be a skilled worker with sufficient points for language, employability, education, age, and adaptability according to the MPNP criteria. Also, applicants must prove to have sufficient settlement funds and the genuine intention to settle in Manitoba as permanent residents.